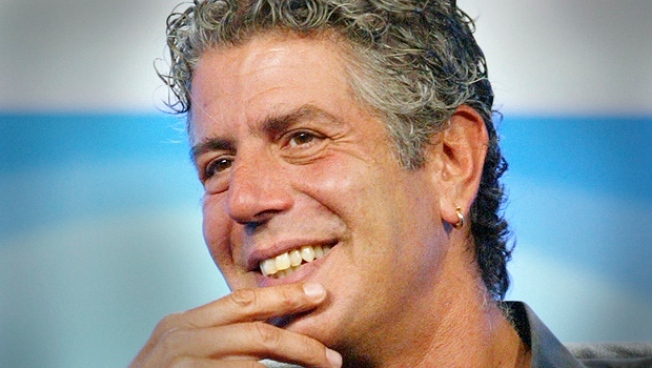 Last night, finally, the long-awaited "Disappearing Manhattan" episode of No Reservations. It was so great that we just had to share a list of Tonyisms about each institution he visited. Plus, for some bonus material, check out cutting-room footage of Tony with former Times critic Mimi Sheradon at Sammy's Roumanian. Preserves that wonderful time of hope, boundless optimism, and completely unfashionable old-school red-sauce Italian-American in a completely non-ironic, handmade, homemade old-school way. It's all about the lox, and about the original product: herring. Herring and cream sauce. It's all about sweet and sour salty goodness. Who invented this combination [bagel, cream cheese, and lox]? There should be a giant statue of them at the door. You only need to walk over to the counter, take a long lingering look at that heap of steaming pastrami, corned beef and brisket, take a deep breath, and you'll remember again what it means to be alive, to be proud to be a New Yorker. Is it morally okay to eat a pastrami sandwich with a fork? No. It should be kind of squirting out the side. Continuous service of these fine [lime rickeys and egg creams] for 70 years, sublime tuna salad on white, and prices that are pretty much along 1985 lines. But most important, this is not some lame-o Johnny Rockets recreation, this is the real thing. They still got the good old stuff at this place -- the gooey faux Cantonese I can't help but be sentimental about. The menu is a journey through the past through dishes that were old even when I was a kid. The owner takes the reservations, hangs your coat, pours your drink, takes your order, and carves tableside. You gotta love this. I don't want no wide screens, high-fiving white guys, no fauxhawks or gel heads or hot chicks with douchebags. I don't want anything on the jukebox that will distract an old gentleman such as myself from drinking the heart right out of the afternoon if I should choose to do so. Where can a guy get a drink when the last gin mill closes down, when there&rsquo;s nothing less but the fern bar or the lounge, when the barkeep has been replaced by the mixologist?